Caution:Lower the torque converter straight down. Failure to lowerthe torque converter straight down could damage the torqueconverter clutch lip seal inside the torque converter clutchassembly. Warning:The torque converter must be held to the torque converterhousing by a retaining device such as shipping brackets. 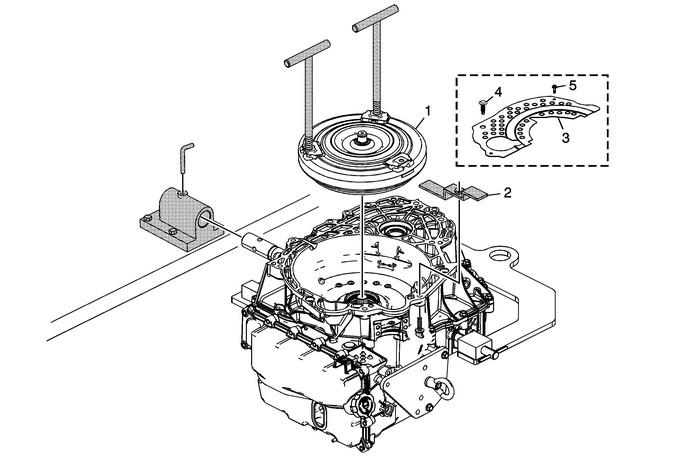 Withoutthe retaining device, the torque converter may slide forward,disengaging the oil pump, or may fall completely out of thetransmission causing personal injury and/or property damage.